On 27th March at 20:40 hrs a Triangle sprinkler system successfully actuated and extinguished a fire at Parkside Court in Chelmsford. Triangle installed and commissioned the sprinkler system in January 2014 in accordance with BS 9251. 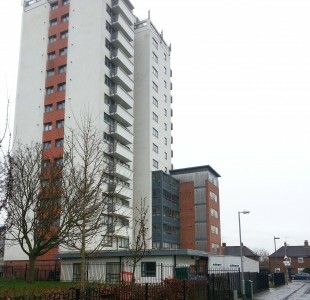 Sprinklers were fitted in all 53 flats as well as the communal areas in the 15 storey block. It was the first tower block in Essex to be fully fitted with a fire suppression system thanks to a £50,000 match funding scheme from Essex County Fire and Rescue Service. The scheme was launched in 2014 to help fund the installation of fire suppression systems in existing blocks of flats. The fire occurred when a chip pan caught light on the hob of a flat on the 13th floor. One VK480 concealed sidewall sprinkler head, fed by a dedicated tank and pump, was activated and extinguished the fire.